Get x antimatter to unlock a new Dimension. You are getting 0 antimatter per second. Make the game 10% faster. The world has collapsed on itself due to excess of antimatter. Double your IP gain from all sources. Forever. Double your EP gain from all sources. Forever. Double all your dimension multipliers (dimensions 1-8). Forever. Double ALL the dimension multipliers (Normal, Infinity and Time). Forever. Disclaimer: These are not required to progress in the game, they are just to help and support the developer. Infinity Dimensions multiplier equal to unspent EP to the power of 5. Unlock more big crunch autobuyer options. You have 0 tachyon particles. Decrease the galaxy threshold multiplier, but resets free galaxies and dilated time. Triple the amount of Tachyon Particles gained. Gain twice as many free galaxies. Time Dimensions are affected by replicanti multiplier ^ 0.1. Normal dimensions gain a multiplier based on dilated time, unaffected by time dilation. Gain a multiplier to IP based on dilated time. Pick all the study paths from the first split. Generate time theorems based on tachyon particles. You've gained 0 tickspeed upgrades. You are getting 0 Timeshards per second. S for sacrifice, D for dimension boost, G for galaxy, C for crunch, A for toggle autobuyers, R for replicanti galaxies, E for eternity. You can hold shift while buying time studies to buy all up until that point, see each study's number, and save study trees. Hotkeys do not work while holding control. You have made x antimatter. You have made x dimensional boosts/shifts. You have made x Antimatter galaxies. You have eternitied x times. Your fastest eternity is in x. You have infinitied x times. Your fastest infinity is in x. You have spent x in this Infinity. Reach infinity for the first time. Buying anything halts your production, gradually coming back over 3 minutes. First dimension is heavily weakened but gets an exponentially increasing bonus that resets on reset. Buying a dimension automatically erases all lower tier dimensions, like a sacrifice without the boost. Whenever you buy 10 of a dimension or tickspeed, everything else of equal cost will increase to its next cost step. 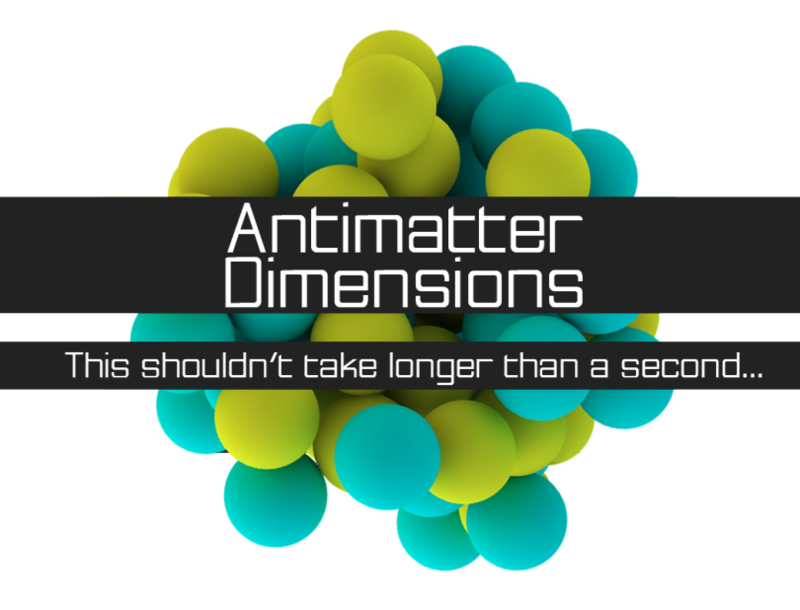 There are only 6 dimensions, with dimension boost and antimatter galaxy costs modified. There's normal matter which rises. If it exceeds your antimatter, it will dimension boost without giving the bonus. Each dimension produces the dimension 2 below it; first dimensions produce reduced antimatter. All previous challenges (except tickspeed challenge and automatic big crunch challenge) at once. Automatically sacrifice every 8 ticks once you have 8th Dimension. Tickspeed interval decrease is always at 0%, but every tickspeed purchase you get a static multiplier on all dimensions (increases with galaxies). Only latest bought dimension production is normal, all other dimensions produce less. When buying dimensions 1-4, everything with costs smaller or equal increases. When buying dimensions 5-8, everything with costs bigger or equal increases. When buying tickspeed, everything with the same cost increases. There's an exponentially rising matter that divides the multiplier on all of your dimensions. Your production is at 100% after purchasing anything, after that it rapidly drops down. Reward: You get a multiplier to dimensions 2-7 based on 1st and 8th dimension multipliers. Complete Eternity Challenges again for a bigger reward, maximum of 5 times. Dimensions 5-8 don't produce anything. Dimensional sacrifice is disabled. All infinitied stat multipliers and generators are disabled. Galaxy cost increase scaling starts instantly (Normally at 100 galaxies). Dimension boost costs scaling is massively increased. You can't gain galaxies normally, but the cost of upgrading your max replicanti galaxies is massively reduced. First Time Dimension produces Eighth Infinity Dimension, and First Infinity Dimension produces Seventh Dimensions. Tickspeed affects all dimensions normally. You can only upgrade Infinity Dimensions 50 times, and Replicanti upgrades 40 times. You can't buy tickspeed upgrades. Infinity power instead multiplies time dimensions with greatly reduced effect. The game runs 1000x slower. Goal: 1e110000 in 0.5 seconds or less. You have made x Infinity points. You passively generate Infinitied stat based on your fastest infinity. You failed the challenge, you will now exit it. Your cloud save appears to be older than your local save. Please select which one you would like to keep. Your local save appears to be older than your cloud save. Would you like to overwrite the cloud save? You have 0 Time Theorems.